Registered as Young Tibet Pictures in the State of New York, Young Tibet is a creative agency established in 2004. 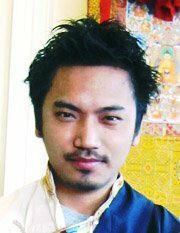 Thupten N Chakrishar (born in Sikkim, India) is a US-based Tibetan entrepreneur, filmmaker, web programmer, author and an activist. Thupten's fictional novel Anything for Tibet, My Beloved Country was the first fictional novel written in English by a Tibetan in Exile . Thupten is the founder of Students for a Free Tibet (India), Young Tibet Pictures, BuddhistApps and VajraTV: Global Buddhist Television Network. In 2001, after studying 3D animation in Square Pixel India, Graphic Designing and web programming from Combit Insitute, New Delhi, Thupten interned at the Moving Pictures Company, India. Later he helped start Bod Gyalo, Tibetan Video News magazine in New Delhi, India before joining the New York Film Academy in 2004. After graduating from New York Film Academy, Thupten joined Mediakite where he continues to work as a NYPD accredited Cameraman and Freelance editor. He has and continues to work for several national broadcasting networks. Under the banner of Young Tibet Pictures, Thupten wrote and directed Following Kunsel and MissTaken. He produced The Heart of Change: Finding Wisdom in the Modern World by HH the Dalai Lama; the film features talks by HH the Dalai Lama, Tsoknyi Rinpoche III, Jetsun Khandro Rinpoche, Robert A.F. Thurman Ph.D, Geshe Thubten Jinpa, Geshe Lobsang Tenzin Negi, Debroah Rozelle, Psy. D, and Charles Raison, MD. Thupten has also worked, in various capacities, in the following films: Ward 54, PBS documentary Pane Amaro, The Last Jews of Libya, Shortcut to Nirvana, The Election Game and others. In September 2009, Thupten founded BuddhistApps.com, an iOS and Android app development company to create Buddhist reference apps for Mobile devices. In December 2010, Thupten started his new company VajraTV: Global Buddhist Television Network, where he currently works.